Part 2 opens with examples of just how widely the calorie formula is used “to lose 1lb of fat you need to create a deficit of 3,500 calories”. Government literature, private health company brochures, diet books, internet sites, nutrition manuals – all list this formula as fact (although most get it embarrassingly wrong, as I illustrate with ease). Thank you so much for your reply. I am not into e.books, I love the old fashion way of reading. Will get the books via Amazon.UK and a friend will bring it in 2 weeks, i can wait. I have over the past 20 years read every diet book on the market and nothing made as much sense are your plan (the bit that i read in one of our local magazines YOU that i bought last week)I think the book for me is Stop Counting the Calories. I cook healthy and invent recipes i need to follow the plan and see what combinations to eat together and what food is allowed and what is not. I have for a while known that i must stay clear of bread. I experimented one weekend a year ago by not eating bread I replaced the bread with FINN CRISP RYE CRACKERS, they are very high in fibre, i lost 2kg that weekend. I eat fairly healthy my down fall is my baking. I bake the most addictive cupcakes and cakes (i have a bakery). I have over the past 2 years tried eating Low GI way, it is not working. I store all my fat around my belly. I am active and healthy, low blood pressure, sugar normal, insulin levels is between 8 and 10. I am on cholesterol tablets 10mg Crestor, my level is below 5 now was 6.3 in 2007 and was put on the tablets. I know that food does not effect my levels, it is the sugar, always had a sweet tooth. I started by cutting out bread and potatoes and sugar products since this week Monday and i must be honest i have no cravings. I use 1 -2 cups of 2% milk per day i have cut down to 1-2 fruits (low GI fruits) i eat brown rice and meat veggies and salad for lunch. Breakfast is 4 finn crisp crackers and cheese and tomato or low fat ham and tomato. Once I have received your book i will know what to eat and when. Keep well and keep up your good work. Hi there – check out our club as well – for support and more info: http://www.theharcombedietclub.com. The bakery is going to be an extra challenge for you! You are so right that the sugary stuff needs to go. Our club would also be horrified to see you on statins (tablets that stop your body making the cholesterol that it is designed to make.) 6.3 was not even high cholesterol and low cholesterol is associated with high death rates – see this blog . So much bad science out there! Hi Leonie – good question – they’re all quite different! “Why do you overeat? when all you want is to be slim” was the first book I wrote (2004) and it answers that question. If you want a ‘how do I lose weight?’ book, the one I would recommend is Stop Counting Calories & Start Losing Weight. It covers the discoveries made for why do you overeat (the three conditions that cause incredible food cravings) and develops all the learnings from the people who first tried the diet and emailed me. There is a recipe book for extra recipes to go with the diet. 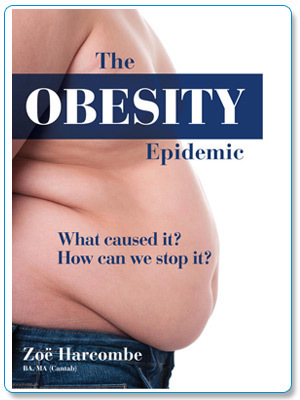 My most recent book – the one on this site – “The Obesity Epidemic: What caused it? How can we stop it?” answers that question. It is quite academic – 400 references. It will kill off any belief in the calorie theory and convince you that processed food – carbs especially – are the cause of the obesity epidemic. It does say how to lose weight, but it’s not a diet book – it’s a ‘what caused the obesity epidemic’ book.